Whooo-eeee, I sure missed the Lammas post by a mile! It’s about the busiest time of the year with all the harvest coming in. Seems that every day I’m picking the must do up the food for storage. Love the fresh ripe tomatoes the best but crisp green peppers and cucumbers make such great eating. My daughter stopped by the other day and when she said she was hungry, I went to the garden and picked salad fixin’s fresh right then. I keep grilled chicken and bacon crumbles handy for summer salads. Add some burnet out of the herb garden, some fresh parsley and what a meal! I’ve been doing a lot of other work also. Just now opened a new shop on Etsy. I’ve called it Studio L Jewellry, featuring my own work and that of Liam Mac Steamish. It’s a fresh start with new things. I hope you will check it out and “heart” it. I’ve not too many items yet but it’s a work in progress. Made some decisions also. Quite a few folk have messaged me and want to know if I am ever going to do new podcasts. It’s been years since I started Salem Avenue and I did have a lot of fun doing it. I am going to try to do my first “new” one on October 1st. I am, however, moving to a new host, one that has better support and more bandwidth. I’m excited about it and have projects planned for my Facebook page and blog and for the podcast. I do believe I’ll start my own webpage on GoDaddy called 1313 Salem Avenue. I’ve got some fun ideas. I want to do some “stone readings” so I can tell you what stones you need in your life, a “stone personality” event and I have plans for a mini tarot reading. You’ll get the mini reading and the cards will tell me what stones you need to wear or carry to help in your situation. I’ve been doing some jewelry experiments also with “living” wearable art. My mermaid gardens are way cool. I have a prototype made and just today made 4 more to sell. Do not have photos of the new ones but here is the prototype. I am a proud member of the Znet Shows design team. This means that, from time to time, I receive some of their beads which I must then use to create original pieces which may or may not be used in their ezine, Creative Spark. 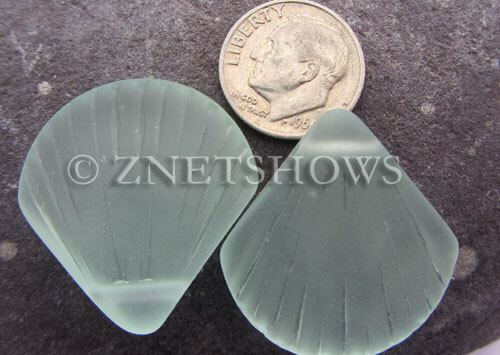 Znet Shows is a wholesale website that has some really beautiful cultured sea glass which I LOVE to work with. When they sent me beads for the winter issue, I was so happy with the colors and the styles! THEN I read the enclosed and realized the theme I had to work with was ICY. ICY! and sea glass which makes me think of sunny beaches, not snow and ice. What the heck were they thinking? I was stumped for a while but one day just got out all my beads and started letting my brain do some mental doodling. Actually, the colors they sent and the frosty look of sea glass was perfect for the wintery theme. I’d like you all to go take a look at the winter issue of Creative Spark! There are some very talented artists who are use other types of beads from Znet Shows so you can get an idea of what else they offer at their site. There are earring tutorials and there is a great article about Yoga for Beaders. To see this issue, you can go to this link. Enjoy it. Share it with your friends! I didn’t use all my beads this time. 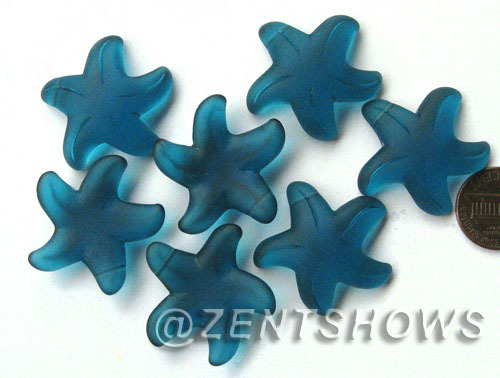 These beautiful little starfish are going to be perfect for some summer barefoot bracelets! And there are so many more colors! I WANT! 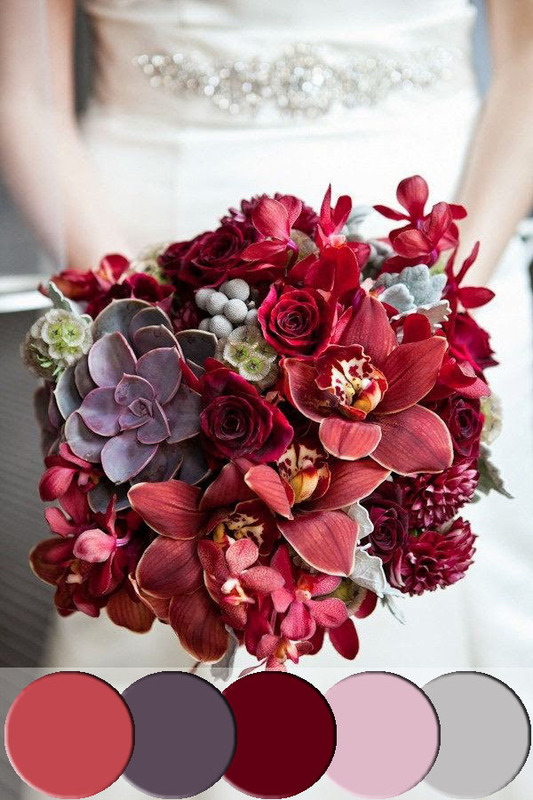 and, I need some of these pretty little shells also though there are so many different colors I can’t decide which. and I have a strand of these beautiful sea blue chips! 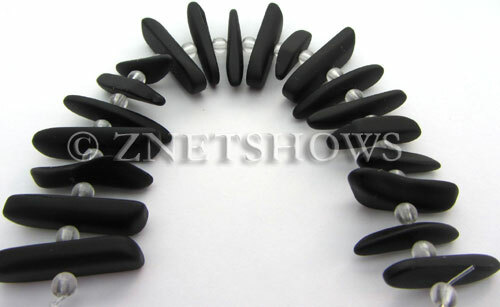 (Znet calls them pebbles, very apropos). I see earrings and a bracelet happening! and I absolutely must buy some of these delightful fishbone beads. They will make perfect daggers for a Halloween design I want to make later this year. A huge thanks to Hope Smithereen whose hard work is evident in this beautiful issue and to Bill Zhang of Znet shows who is kind and generous and easy to talk to and also runs Graphic Stock. Every month, Erin Prais-Hinz posts a color palette for Halcraft. Just so you know, you can find the beads at Micheals Craft stores. 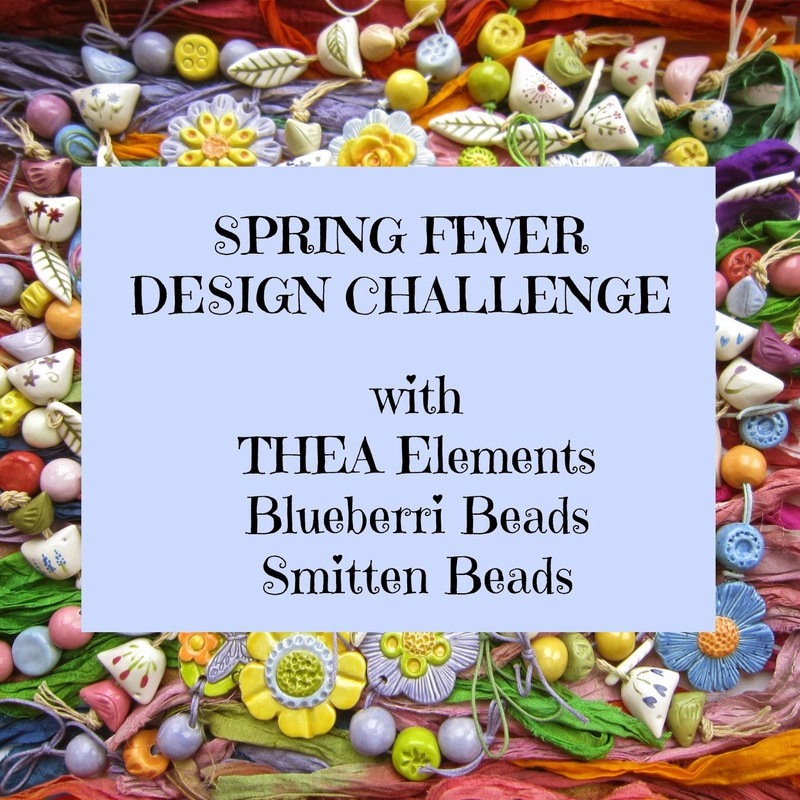 Erin always has a great blog about the color palette of the month and everyone is invited to play along, creating something with beads from that palette. This month, the January Pretty Palettes Challenge was to be in colors that matched Pantone’s color of the year, Marsala. This was her photo. I’ve always got some beads around from Micheals and just happened to have some dusty pink and some wine colored ones. 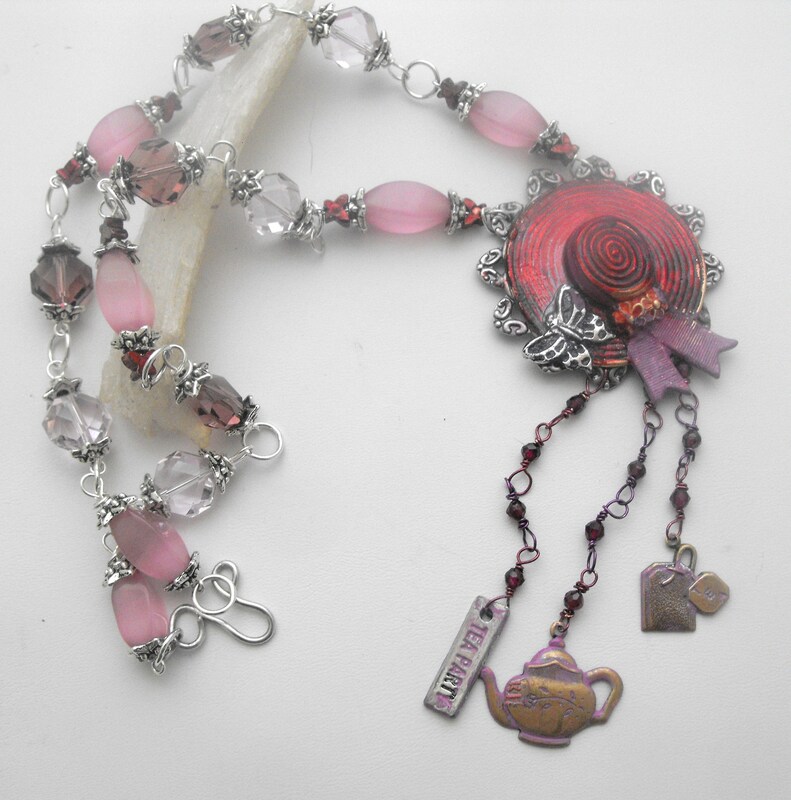 I also had an old fashioned bonnet focal and some little tea party charms that I had been wanting to use some way, some how. So I got out some alcohol inks, colored the bonnet focal, put some tiny garnet beads with the pink and wine beads, made a bit of beaded chain with the garnets and wire This is what I came up with. I know, Erin, I probably should have taken a photo of the beads from Micheals before I used them. I did, however, keep the SKU numbers for two of the bead strands. YAY for me! There are so many stones to choose from, it’s hard to narrow down the field to a few that are MUST HAVES for every pagan, well actually every person could benefit from these. I’ve tried to choose just 9, a magical 3X3 number that every witch should have. If I had to limit myself to just a few, these are the stones I would have. Amethyst: In addition to its usual well known uses, this stone is a powerful psychic tool, will protect you from black magic and will aid in second sight, intuition, and insight. Malachite is probably the most powerful of all the “eye stones” which were prized in ancient societies to protect against the evil eye. Malachite is said to enhance visionary powers and to stimulate all types of personal power. 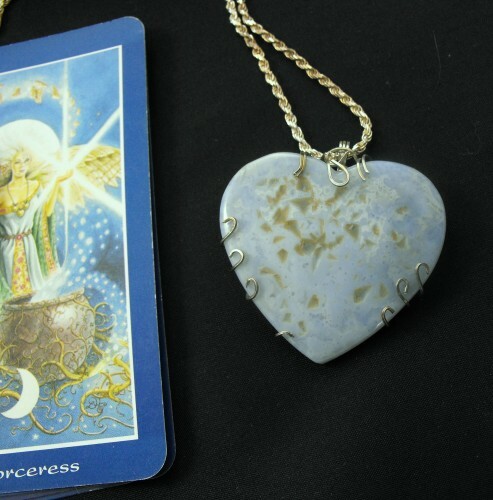 It wards off negative vibrations and is said to warn an owner of impending danger by breaking. It promotes inner peace and hope and offers protection and inner security. 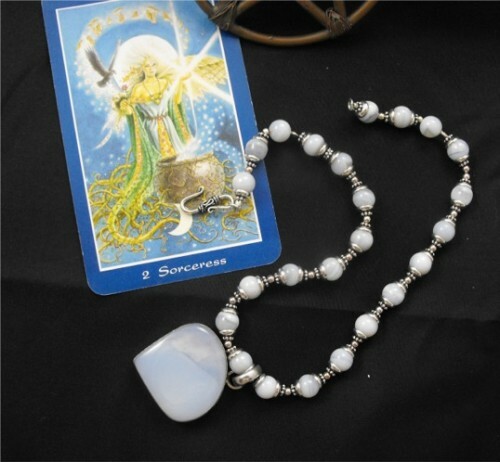 Moonstone: A very sensitive stone whose powers increase with the moon. It helps promote love, not just romantic love, but love of friends and family and love for humanity because it opens your heart to experience love. It lends you strength when you are emotionally overextended. It inspires self confidence. It is a great stone for people who carry around a burden of buried anger. Carnelian is a must, not only because of its other properties, but because it is a stone which will clean the negative energies away from other stones. Carnelian can motivate you and give you energy to turn your ideas and dreams into form. It’s a stone of success and can give you physical power. 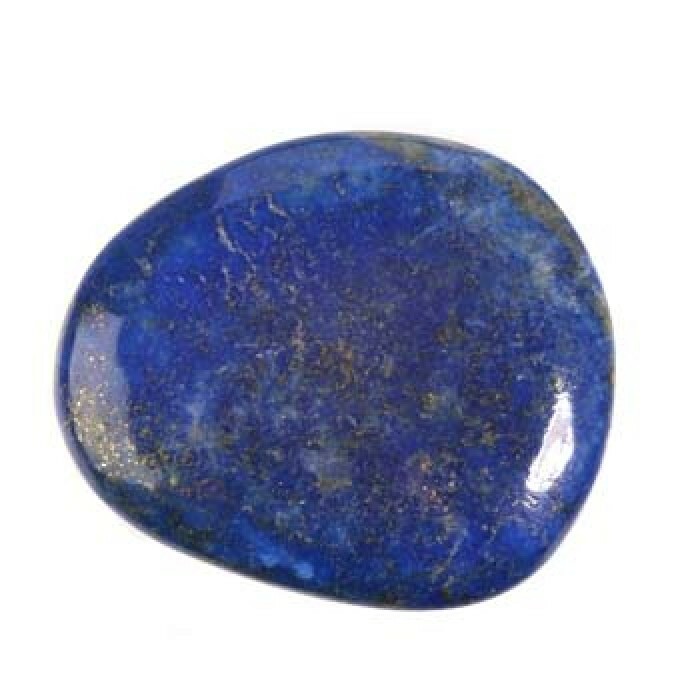 Lapis throughout history has been associated with wisdom and love and is a stimulant for psychic abilities. It strengthens your body and mind. It will stimulate your inner vision and enhance your wisdom, insight and good judgment. This stone is a must because not only is it grounding and good for protection, obsidian acts like a screen to keep all negativity surrounding you at bay. Never exchange your own piece with another person or accept a stone that someone else has worn. It bonds to a person and should stay with its original owner. This one is a given. Everyone knows you need clear quartz crystals, not only as a communication aid, but because it drains off any blocked areas that keep your dreams from coming true. It helps you use your own inner resources and potential and get ride of self blocks. It’s a wonderful energy conductor. A stone that helps you find love, first self love because you cannot love someone else unless you first love your own inner person. Not only does it help enhance your outer beauty but it helps get rid of negative energy from the past. 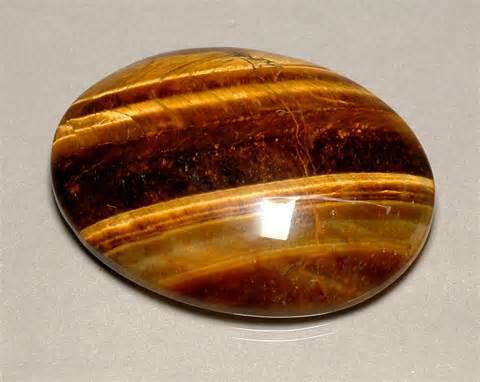 Tiger’s eye is a great stone that helps you think clearly and helps you make right decisions. it helps yous ee what you are getting into before you take steps forward. It helps with clear thinking, good judgment and protection. Couldn’t ask for more. So there they are. If you have these gems, you pretty much have all angles covered. Erin Prais-Hintz of Tesori Trovati has come up with yet another unusual challenge for us. She has done this in part to create awareness for an increedible organization Music & Memories. These folks supply Alzheimers patients with Ipods and playlists. Patients show improved memory function and interactive skills after listening to their favorite tunes. If you visit their webpage, you will see an incredile video featuring a man who barely spoke at all yet after listening to a tape of his old time favorite tunes perked up and chattered away with others. Music plays such an integral part in our lives. Tunes we hum or sing along with brighten our days. Music can take us back to a happier time, to some crazy memories, it can soothe us when we are sad and calm us when we are angry. Here’s what we had to do for Erin’s challenge: Pick a song, one from another year that evokes a memory. Use that song to inspire us to create a piece of jewelry. I chose a song that came out in 1977, written by the talented Stevie Wonder. It’s a song about music and how it plays such a part in our lives. When this song was popular, I had met Ben and Justin’s father and we fell in crazy loco love. We both loved music and loved to dance. When we danced, we were like that couple in Dirty Dancing, eye to eye, in sync, fancy steps. Once, when we went out to dinner, my first time out in cool clothes since Justin had been born, we danced to this song. You know those old corny movies when the cute couple dances and everyone else clears the dance floor then breaks out in applause? That happened to us. That’s the way it was with us. We would dance in the kitchen, the living room and out on the sidewalk if one of “our songs” came on. And people loved us! Here’s the lyrics, just in case you didn’t get them. ( Sir Duke, by Stevie Wonder). Did you feel it? It’s happy, it’s young, its alive with LIFE! Here’s my bracelet. It’s orange and peach and creamy white, young vibrant and happy colors. The chain and the music notes are gold because gold is rich and warm. The little charm is one I got from Tealwater Designs in the Art Charm Exchange. My bracelet is not original or trendy but it has LOTS of beads that will click and shoosh with a percussive sound when I wear it and give a beat to my day as I work or play. I’m going to keep this bracelet and not put it in the shop. But, Erin is going to have an auction after this blog hop, to benefit Music and Memories Organization. So, I wanted to make something to put in the auction. I made these little earrings, a variation on the art charm I made and my own design so here we go. I’ll let you know when the auction is held so anyone interested can support this organization. If you want to see what others have made, check out Erin’s blog. Oh, I do love the jewelry challenges! And Heather Powers of Humblebeads has tossed out a really good one. This is a major Mojo Challenge and last 10 weeks! Wow! And a huge challenge it is! 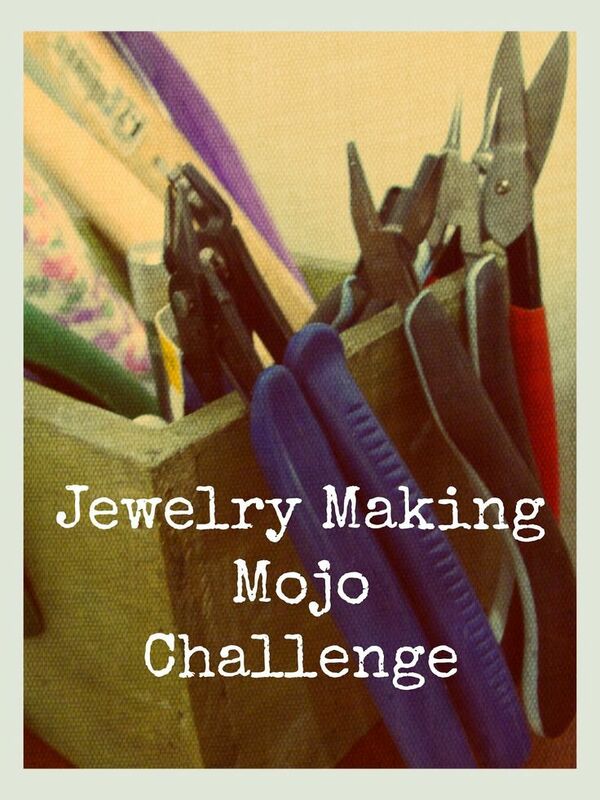 Any of you beaders or jewelry makers who might want to get in on it, this is week one and I think you can still sign up. Our first week’s task is to JOIN a CHALLENGE! No problem for me. 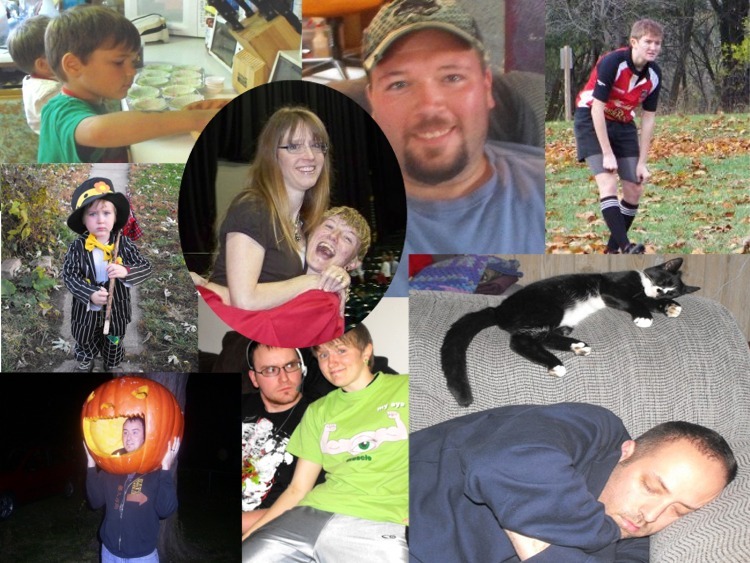 Heather, I’m assuming you did not mean just join the Mojo Challenge so here are my other challenges. Earrings Everyday Blog has a monthly challenge. 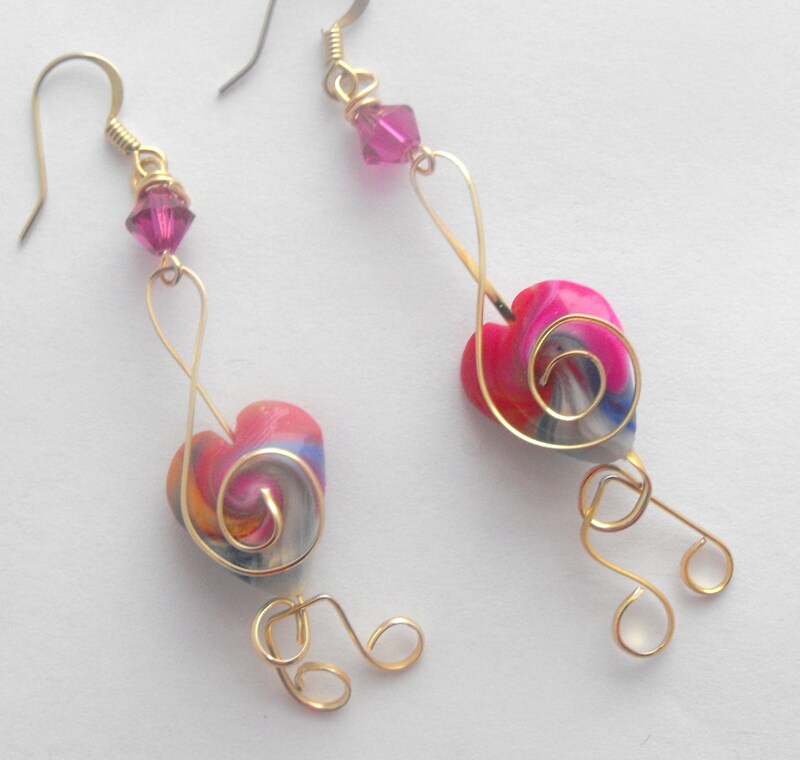 Using art as inspiration, we will make a pair of earrings every month. But, I am already IN this challenge so that may not count. 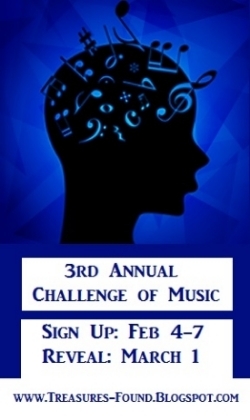 And, I am already in Erin Prias-Hintz’s Music & Memory Challenge coming up this week so that may not count either. 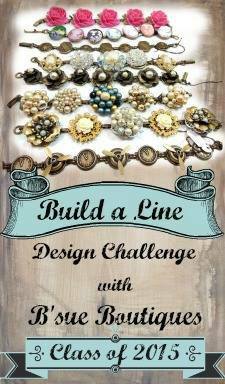 Lucky for me, Lesley Watt of the Gossiping Goddess blog and Thea Two jewelry and Caroline of Blueberri Beads opened up a challenge just yesterday! Woot Woot! I’m IN. PLUS! I’ve got a chance to win some awesome beads made by these ladies! Woot woot!!! Beading friends! Jump in this one! 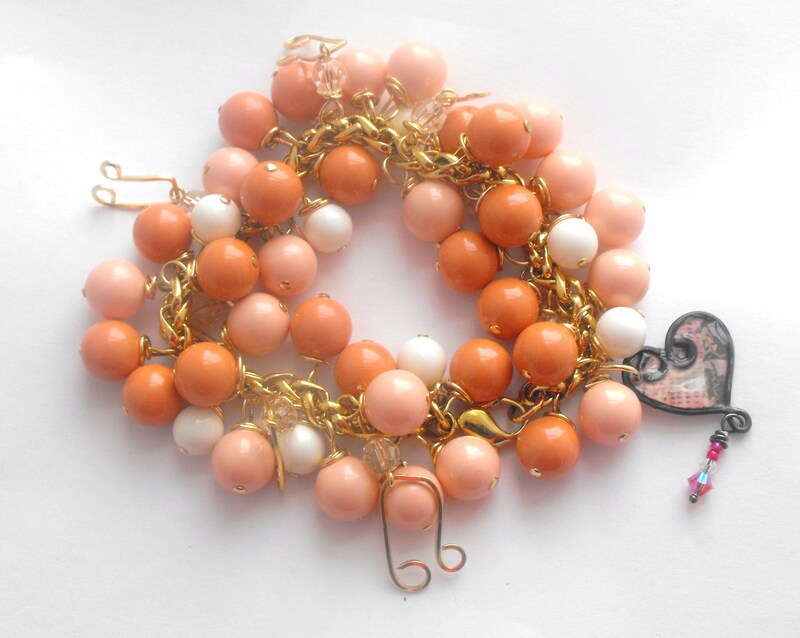 The beads are fabulous, fantastic and spring colors! Wow! And Smitten beads is adding some bright and colorful sari silk! Now, when am I going to find time to do all this work? Stand back ladies, there’s beading to be done!!! Not all pagans are readers. Not everyone is interested in foreseeing future events nor is every pagan adept at reading. Just because you can do one type of reading, does not mean you can do all types of readings. When I bought my first deck of tarot cards, I only half believed that they would “work”. I read through the book, well sort of……. 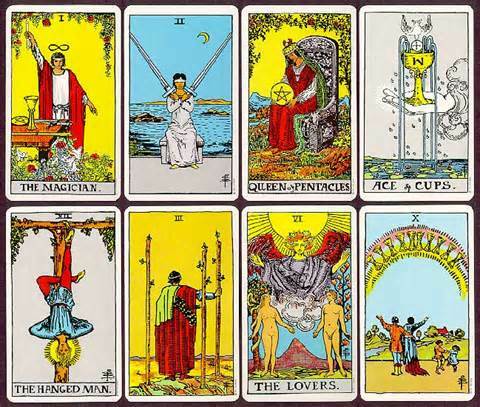 I read about the different suits and I read about the Major Arcana then studied a little bit about individual cards. At the commune one day, over coffee, I was talking to my 3 closest friends and of course they wanted a reading. We all thought it was quite a lark and I laid out the cards for my friend Kay. She and her husband Will were quite the perfect couple with two adorable children and the unofficial leaders of the group effort. I laid out the cards then laughed right out loud. “Kay, this is the craziest thing! These cards say you are thinking of leaving Will. You will meet a guy with blonde hair and blue eyes and though it will take some thought, you will probably leave. My reading ceased to be hilarious. She looked at me with soulful eyes and told me “I’ve already met him. His name is Mack and I’ve been seeing him for two weeks”. After the shock wore off, I realized that knowing the future can lead to unwanted intimacy. I would rather not have known my friend’s secret. After all, they were both my friends and I felt bad keeping such a secret from Will.
. I knew right then that this was not a parlor game, but some way to tap in to a universal consciousness and pick up information just floating around in the Universe. How it happens is beyond me. I’ve tried different decks. I’ve seen online “classes” and deep interpretations of the meanings of each card. Still, though I know basic things, I am not a student of Tarot meanings. How the information comes to me remains a mystery. Somehow, I quiet my mind and shuffle then lay down the cards. I do not ask leading questions, I do not do a long study of the layout. I simply say what flashes through my mind and I speak. When I was reading frequently, I could tell if trouble was coming: problems for the reader, by the way the cards shuffled. If it was a struggle, the cards did not want to fall together easily, there would be information the person did not want to hear. If they shuffled easily and smoothly, it would be a “good” reading. Once, my hands shook so badly when shuffling that I refused to do the reading. I found out why later. When my son was missing, I went to another reader whom I trusted completely. She laid out the cards and told me he was alive and gave me hope. I looked at her layout and knew he was dead. Only twice have I doubted myself since that first reading. Once, a friend brought me an acquaintance of hers. I had never seen this woman before. I could tell she was from a rather affluent family and she presented herself as a person as one of those sugar sweet girls who would do no wrong. . When I laid out her cards I was appalled. How could I say this to her? She was such a “nice” girl! I took a deep breath and said “It seems here that you are pregnant”. She started to cry. I then told her that she was not sure who was the father, it could be one of two men. She cried harder. Then, gaining confidence that it was a true reading, I told her that the man she wished were the father was most likely not the one and she would have hard decisions to make. I was right on, all the way. The only other time, I did a reading for a very very skeptical friend. He was seeing two ladies and both had had hysterectomies. When a “BIRTH” came up in the reading, he laughed and taunted me. Three weeks later, he called to tell me that one of the women had called him and she knew not how, but was presenting symptoms of pregnancy and wanted to talk to him. He laughed no more. And I never doubted myself again. There are so many ways to try divination: tarot, palm reading, scrying, candle flames and tea leaves are most common. I’ve never been able to do any others. I tried crystal gazing and scrying with minimal success. They seemed to be better for meditation than for readings. Tea leaves are way beyond me. In fact, I see nothing when I look into the bottom of the teacup. Perhaps I do not spend enough time contemplating while I drink the tea. Perhaps it is because I am a more visual person and color and form speak to me more than contemplation. I would love to hear from other readers and how they think their intuition comes to them. Tea leaf readings fascinate me. I found a lady through PBP who does really good readings. You should check out Alverdine’s blog here. Every month, she does a “Cup of the Month” reading and posts the picture of the cup and her interpretation online. Next month, her cup of the month will be my reading. It’s supposed to be anonymous but I do not mind letting anyone know that the reading is mine. With her permission, I am posting a picture of my “cup” here. You should check back next month for my reading and see how she interpreted my leaves. You may want to get a reading of your own. Okay: here is my cup. 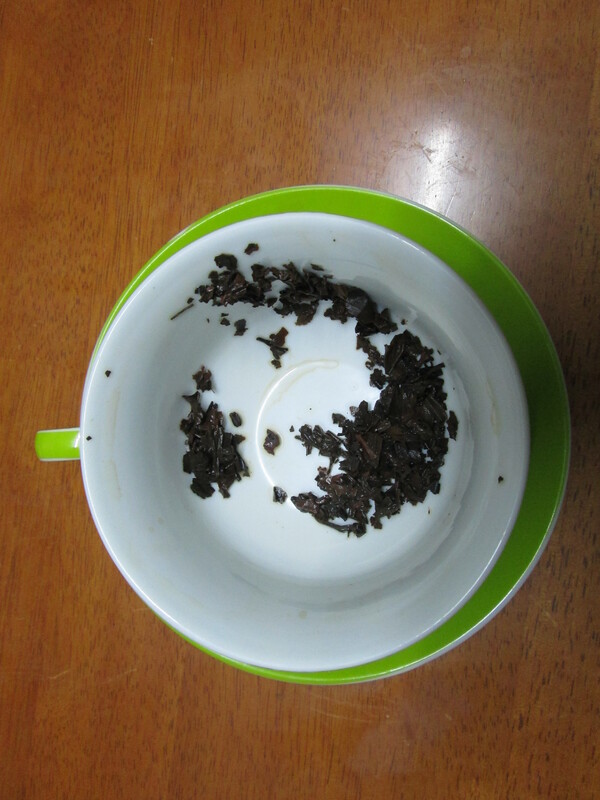 Now, when I look at this, no matter how hard I try, I really see nothing but tea leaves. Well, if truth be told, there might be a giant hand over there on the right, trying to scoop up a pile of something. I can only wish it would be CASH! LOL Or, if I look a little harder, maybe on the right is a giant, not like the Jolly Green Giant but maybe like the Iron Giant (I watch a lot of little kids movies) and maybe he has an erect phallus like Kokopelli. Well, you can see where MY mind goes trailing off to. Believe me, I have seen Alverdine’s interpretation and it in no way resembles my own. Tell me what YOU see. And be sure and check with her next month to see what she read for me. Once you read it, you will wonder why you did not see what she saw. You will also be amazed that she got so much out of the dregs of a cup of hot tea. 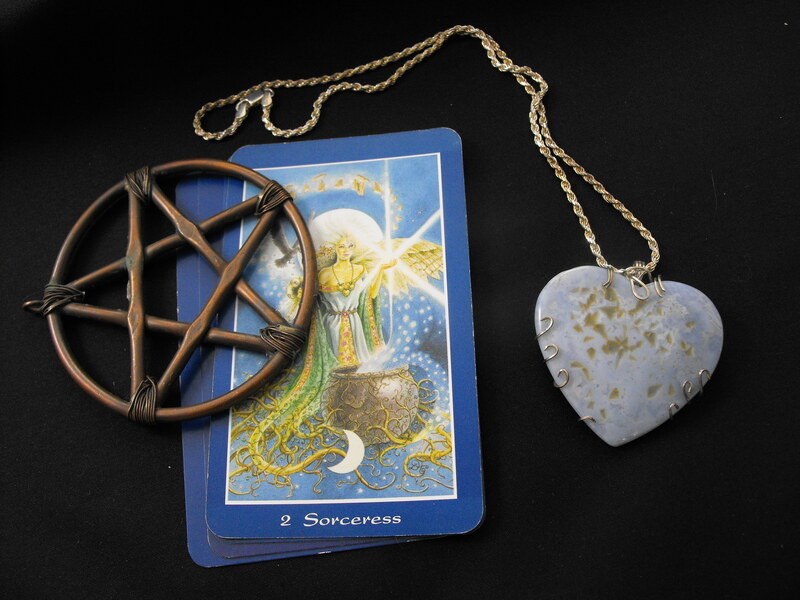 To sum up, if you are trying to decide which divination method to use, I do not believe it is possible to just say “OH, I am going to learn to read tarot cards”……..or tea leaves, or whatever method looks cool to you. You will have to experiment and see what resonates with you, what vibrates. Then, do what comes naturally. You knew that sooner or later, I would have to put in a post about a stone or some jewelry, didn’t you? It’s what I love and what I do. One of my favorite stones is chalcedony. It’s a microcrystalline form of quartz which means that the quartz crystals are too tiny to be seen with the naked eye. The chalcedony rose is one of my favorites to work with. Some ancient cultures believed that there was an ancient spirit in this rock and if you meditated, you would connect with this being who would then become one of your guides through your earth journey. If you do use one of these for meditation, you will almost see an ancient wizened face peering out at you. In ancient times, goblets were made of chalcedony and lined with silver. They were said to prevent poisoning. I do not think I would care to test this. Chalcedony is said to bring the mind, body, spirit and emotions into harmony. It is a stone of brotherhood and goodwill and enhances group stability. Blue chalcedony, my particular favorite, is a creative stone which opens the mind to new ideas and helps you assimilate to new situations. According to my friend Ken Harsh who has been collecting and dealing in rocks since 2000 B.C. , (RIP Ken) it was a stone worn my high priestesses of Atlantis to enhance their beauty. Speaking from personal experience, whenever I wear it, I get compliments on how pretty I look that day. And when you are my age, it’s hard to get compliments like that! It’s also good for enhancing listening skills and communication skills. It was used in weather magic and in curing illnesses associated with changes in the weather. Here is a piece from my shop, a rougher cut of blue chalcedony. And this necklace, with a focal of blue chalcedony and beads of the same blue with silver beads. You can perhaps see that is is worthy of a high priestess……the color, I mean. my photo is not the greatest! Chalcedony comes in blue, pink, red and dendritic forms. 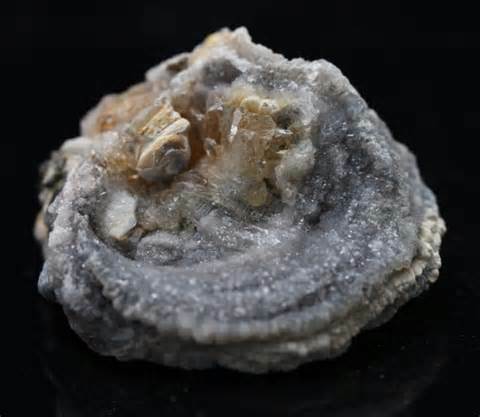 As a healing stone, it is used, in general, as a cleanser and for giving physical stamina. If you would like to know the specific uses for the other colors, just ask me. I’ll be changing my blogging practices this year, not all of the posts will be about my jewelry and/or family and not all will be long with lots of photos. I’ll still do some blog hops and I’ll still log what I’m working on. BUT, I’m going to join some other bloggers and have a bit of fun and just maybe open up some creative and spiritual avenues inside my head, or revisit them anyhow. I’ve done a few blog hops with Eris Prais-Hintz of Treasures Found. She has invited us to participate in 30 Word Thursdays. Here’s how it works. I post a photo that I have taken and underneath describe the feelings said photo evokes using only 30 words. I’ve seen Erin’s efforts and your description becomes a sort of tonal poem. Breaking a description down to 30 words only isn’t easy. I’m not sure how consistent I will be with this. I am a sporadic picture taker at best but for now, I have a backlog of pictures from last summer to get me started. My next venture. I’m joining the Pagan Blog Project. Over 226 bloggers are participating so far and it looks like a great way to deepen my spiritual feelings. Each week, we will be given a letter and using that letter we will take one word that has particular meaning in pagan paths and focus upon our feelings. We will all post on Fridays (YES! I KNOW it’s the day after 30 Word Thursday, but I think I can keep up if I don’t get too wordy) A lot of my practices are based heavily on Native American teachings and Celtic lore so I expect I’ll be focusing on those aspects. That said, I’m going to start out with last Friday’s letter , A. I’m too late to join the group posting but I don’t want to leave out one letter. 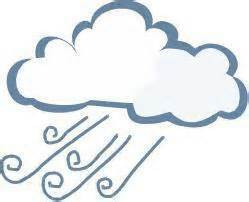 AIR: I could get verbose and go on and on about the attributes of the element of air: It’s associated with the East, creativity, blah blah but that is not how I want to write. I want to explore what this element means to me. It’s such a sacred element. All the tribes of our earth depend upon air to sustain life, the Two Leggeds, The Four Leggeds, The Winged Ones, The Standing People (trees), and so on. Only the Stone People do not depend upon air for Life. Air is therefore sacred. With this thinking we should be very aware of what pollutants we put into the sacred Air of our Earth. Our breath is air and also sacred. Breathing deeply and correctly is so important for health and for meditation and maintaining Beauty and Balance. Thinking thus, we should be extremely conscious of how we pollute our breath with smoking and heavy perfumes. (As I was thinking along these lines, I had extreme guilt about smoking). Our words are our breath and therefore sacred and we should be very cautious about how our words can pollute our lives and those of others. I thought about the news this week, all those chemicals released into that beautiful river. I talked with others about this terrible event, thousands of people unable to drink water or even wash their clothes because no one seemed to know for certain how dangerous this chemical could be. I heard many statements…..words tossed out. Did your words quickly condemn the company that allowed the escape of dangerous chemicals? Did your word praise the companies like Pepsi, who donated water to thousands? Or did you go the “extra mile”? Did your words give thoughts to all the wild creatures and livestock and water creatures and birds who would have no warning to not drink tainted water and voice a prayer to the god/goddess/creator that these creatures be safe and that someone in a better position that you would be able to help them? One of the reasons I love being pagan……….there are no easy answers, no black and white, no commandments, only the stricture to “harm none”, therefore I must take responsibility for my own actions and think about how they AND my words will spill out into the Universe and effect others. I’m looking forward to meeting some new people through the Pagan Blog Project and 30 Word Thursday. Maybe some of the great photographers whose blogs I follow will join in for 30 Word Thursday! Oh, and since most pagans are into stone lore, I can sure blog about stone jewelry if I get stuck for a topic., LOL. I”m a busy girl so I will get right to the point. 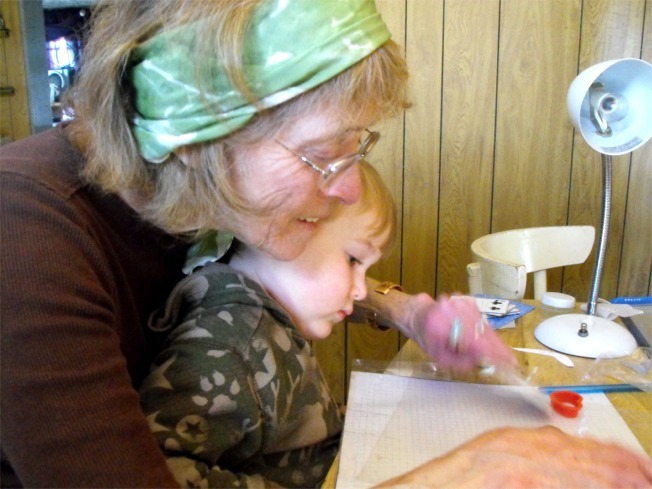 My Mimi wants me to be sure and tell you that handmade presents are the best presents! So give the big companies a raspberry and support small businesses! My cousins went to Mimi’s house to make presents. They made magnets for kids and purse charms for ladies. They used the little resin caps. Next week they are going to make fingerprint magnets for the grandmothers refrigerators. I’m going to do it too. And we are making dog treats too. I hope those boys made me some beads. I don’t have nearly enough. Mimi let Nikolai use the scissors! My mom doen’t let ME do that!!! These are for the purse charms and key rings. Crabby Patti with 68 strands of beads! Last week, my Mimi had a blog hop and promised to give away some beads to another lady who makes jewelry and some earrings to someone who just stopped by to visit. I got to pick the names out of a huge big fishbowl! AND THE WINNER OF THE EARRINGS IS……………………..
PRISKA:! Send my Mimi your address ans she will mail them out next week! This is what they look like. I GOT TO PICK ANOTHER NAME. THIS BEAD LADY WHO LEFT A COMMENT GETS THESE SPECIAL BEADS FROM THE GEM SHOW. MIMI SAYS THEY ARE CALLED DRAGON’S VEIN. They are really tiny geodes and if you don’t want to string them like this, you can crack them open and inside are little crystals and you can wire wrap them like that instead. AND HERE IS THE NAME i PICKED OUT! Okay, I”m done now. I’ve got places to go and people to hug. I’ll be back. Win it next week on her Facebook page so look for Strega Jewellry and “like” her page and watch for the pinit thing. 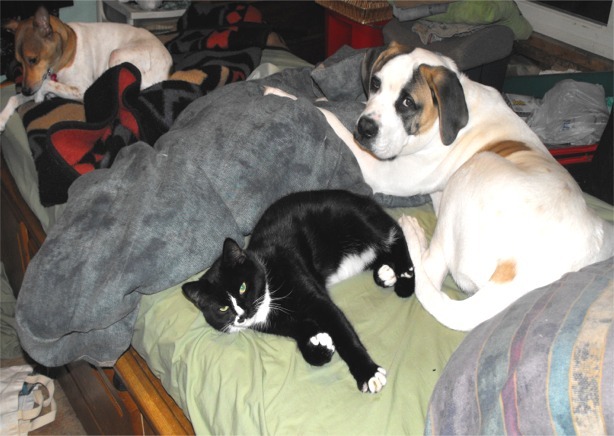 I am a lively Aries lady who lives in a house owned by a bunch of wacky animals. I am the matriarch of a clan of kids, grands and great grands. I am a solitary Wiccan whose pagan roots are both Native American and Celtic, strongly connected to the earth. 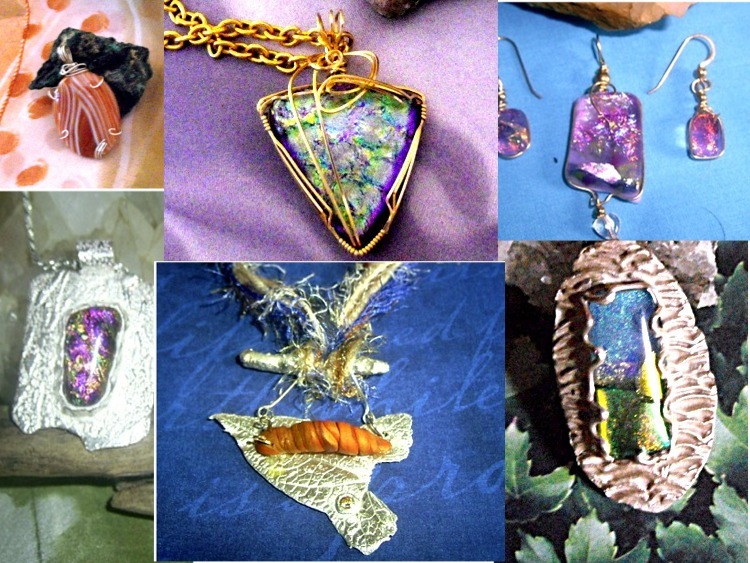 I am a jewelry artisan, addicted to beads, wire, silver, rocks, stones and minerals. I love working with metal clay, wire and natural stones. I am a teacher. I’ve learned a lot about stones and minerals and folklore: the history behind the stones. I teach special classes for underpriveleged kids. I teach everyone who asks about the ancient uses of rocks and stones.